For the architect in Boston, Massachusetts, see Joseph Edward Billings. Joseph Billings (c.1758 – 1806) was an English navigator and explorer who spent the most significant part of his life in Russian service. In 1785, the Russian government of Catherine the Great commissioned a new expedition in search for the Northeast Passage, led by English officer Joseph Billings, who had previously sailed with Captain Cook, and the Russian officer Gavril Sarychev as his deputy and Carl Heinrich Merck as the expedition's naturalist. This enterprise operated till 1795. Though considered a failure by some scholars because the expenditures outweighed the results, it nevertheless had a substantial record of achievement. Accurate maps were made of the Chukchi Peninsula in Eastern Siberia, the west coast of Alaska, and the Aleutian Islands. Members of the expedition landed on Kodiak Island and made an examination of the islands and mainlands of Prince William Sound. Additionally, the expedition compiled a census of the native population of the Aleutian Islands and reported to the crown stories of abuse by the Russian fur traders (promyshlenniki). After the Expedition, Joseph Billings remained with the Imperial Russian Navy, before retiring in 1797 and settling in Moscow. Billings died in Moscow on 18 June 1806 at the age of 48 years. Cape Billings in the Chukotka Autonomous Okrug was named after him. Three contemporary accounts about the Billings expedition were written. The first account to be published was entitled An account of a geographical and astronomical expedition to the northern parts of Russia: for ascertaining the degrees of latitude and longitude of the mouth of the river Kovima, of the whole coast of the Tshutski, to East Cape, and of the islands in the eastern ocean, stretching to the American coast, performed ... by Commodore Joseph Billings, in the years 1785, &c to 1794 and was written by Billings' secretary and interpreter Martin Sauer.It was published in London by T. Cadell in 1802. In the same year was also published G. A. Sarychev's account, written in Russian and comprising 2 volumes which were accompanied by a folio atlas of 50 sheets, under the title Puteshestvie flota kapitana Sarycheva po severo-vostochnoj chasti Sibiri, Ledovitomu morju i Vostochnomu okeanu s 1785 po 1793 god (Navy Captain Sarychev's Voyage in the North-Eastern Part of Siberia, Icy Sea and Eastern Ocean over Eight Years, under the Supervision of Navy Captain Billings from 1785 until 1793).It was published in St. Petersburg. The third account was written by Carl Heinrich Merck.His journal had been lost but was rediscovered in 1935. It was first published in 1980. ^ Jones, Ryan (2006). "Sea Otters and Savages in the Russian Empire: The Billings Expedition, 1785-1793". Journal for Maritime Research. 8 (1): 106–121. doi:10.1080/21533369.2006.9668358. ^ Nuttall, Mark (2012). Encyclopedia of the Arctic vols.1, 2 and 3 (A to Z). New York and London: Routledge, p.243. ISBN 978-1136786808. ^ Inglis, Robin (2008). Historical Dictionary of the Discovery and Exploration of the Northwest Coast of America. Lanham, Maryland; Toronto; Plymouth, UK: Scarecrow Press, p.289. ISBN 978-0810855519. ^ "The Naming of Alaska Explorers: "S"". ExploreNorth. Retrieved 22 January 2016. ^ Inglis, Robin (2008). Historical Dictionary of the Discovery and Exploration of the Northwest Coast of America. Lanham, Maryland; Toronto; Plymouth, UK: Scarecrow Press, p.216. ISBN 978-0810855519. Chukotka Autonomous Okrug or Chukotka (Чуко́тка) is a federal subject of Russia. It is geographically located in the Far East region of the country, and is administratively part of the Far Eastern Federal District. Chukotka is the 2nd-least-populated federal subject at 50,526 (2010) and the least densely populated. Friedrich Benjamin Graf von Lütke, more commonly known by his Russian name Fyodor Litke, was a Baltic German navigator, geographer, and Arctic explorer. He became a count in 1866, and an admiral in 1855. He was a corresponding member (1829), Honorable Member (1855), and President (1864) of the Russian Academy of Science in St. Petersburg. He was also an Honorable Member of many other Russian and foreign scientific establishments, and a corresponding member of the French Academy of Science in Paris. Gavril Andreyevich Sarychev, spelt "Sarichef" in the United States, was a Russian navigator, hydrographer, admiral (1829) and Honorable Member of the Russian Academy of Sciences (1809) in Saint Petersburg. Ilak Island is a small island in the eastern Delarof Islands, Aleutian Islands of Alaska. Spanish claims to Alaska and the West Coast of North America date to the papal bull of 1493, and the Treaty of Tordesillas. In 1513, this claim was reinforced by Spanish explorer Vasco Núñez de Balboa, the first European to sight the Pacific Ocean, when he claimed all lands adjoining this ocean for the Spanish Crown. Spain only started to colonize the claimed territory north of present-day Mexico in the 18th century, when it settled the northern coast of Las Californias (California). The Great Northern Expedition or Second Kamchatka expedition was one of the largest exploration enterprises in history, mapping most of the Arctic coast of Siberia and some parts of the North America coastline, greatly reducing "white areas" on maps. It was conceived by Russian Emperor Peter I the Great, but implemented by Russian Empresses Anna and Elizabeth. The main organiser and leader of the expedition was Vitus Bering, who earlier had been commissioned by Peter I to lead the First Kamchatka expedition. The Second Kamchatka Expedition lasted roughly from 1733–1743 and later was called the Great Northern due to the immense scale of its achievements. The promyshlenniki were Russian and indigenous Siberian contract workers drawn largely from the state serf and townsman class who engaged in the Siberian, maritime and later the Russian American fur trade. Initially the Russians in Russian America were Siberian fur hunters, although many later worked as sailors, carpenters, artisans and craftsmen. Promyshlenniki formed the backbone of Russian trading operations in Alaska. By the early 1820s, when the share system was abandoned and replaced by salaries, their status remained in name only; they became employees of the Russian-American Company and their duties and activities became increasingly less involved in the fur-gathering activities of the Company. The Aleutian Islands, also called the Aleut Islands or Aleutic Islands and known before 1867 as the Catherine Archipelago, are a chain of 14 large volcanic islands and 55 smaller ones belonging to both the U.S. state of Alaska and the Russian federal subject of Kamchatka Krai. They form part of the Aleutian Arc in the Northern Pacific Ocean, occupying an area of 6,821 sq mi (17,666 km2) and extending about 1,200 mi (1,900 km) westward from the Alaska Peninsula toward the Kamchatka Peninsula in Russia, and mark a dividing line between the Bering Sea to the north and the Pacific Ocean to the south. Crossing longitude 180°, at which point east and west longitude end, the archipelago contains both the westernmost part of the United States by longitude and the easternmost by longitude. The westernmost U.S. island in real terms, however, is Attu Island, west of which runs the International Date Line. While nearly all the archipelago is part of Alaska and is usually considered as being in the "Alaskan Bush", at the extreme western end, the small, geologically related Commander Islands belong to Russia. he maritime fur trade was a ship-based fur trade system that focused on acquiring furs of sea otters and other animals from the indigenous peoples of the Pacific Northwest Coast and natives of Alaska. The furs were mostly sold in China in exchange for tea, silks, porcelain, and other Chinese goods, which were then sold in Europe and the United States. The maritime fur trade was pioneered by Russians, working east from Kamchatka along the Aleutian Islands to the southern coast of Alaska. British and Americans entered during the 1780s, focusing on what is now the coast of British Columbia. The trade boomed around the beginning of the 19th century. A long period of decline began in the 1810s. As the sea otter population was depleted, the maritime fur trade diversified and transformed, tapping new markets and commodities, while continuing to focus on the Northwest Coast and China. It lasted until the middle to late 19th century. 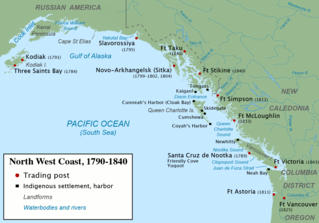 Russians controlled most of the coast of what is now Alaska during the entire era. The coast south of Alaska endured fierce competition between, and among, British and American trading vessels. The British were the first to operate in the southern sector, but were unable to compete against the Americans, who dominated from the 1790s to the 1830s. The British Hudson's Bay Company entered the coast trade in the 1820s with the intention of driving the Americans away. This was accomplished by about 1840. In its late period, the maritime fur trade was largely conducted by the British Hudson's Bay Company and the Russian-American Company. The era of European and American voyages of scientific exploration followed the Age of Discovery and were inspired by a new confidence in science and reason that arose in the Age of Enlightenment. Maritime expeditions in the Age of Discovery were a means of expanding colonial empires, establishing new trade routes and extending diplomatic and trade relations to new territories, but with the Enlightenment scientific curiosity became a new motive for exploration to add to the commercial and political ambitions of the past. See also List of Arctic expeditions and List of Antarctic expeditions. Polynesians reached nearly all the Pacific islands by about 1200 AD, followed by Asian navigation in Southeast Asia and West Pacific. Around the Middle Ages Muslim traders linked the Middle East and East Africa to the Asian Pacific coasts. The direct contact of European fleets with the Pacific began in 1512, with the Portuguese, on its western edges, followed by the Spanish discovery of the Pacific from the American coast.